This image shows two separate collections of galaxies. The most prominent galaxy is NGC 3718 (Arp 214). NGC 3718 is classified as a peculiar barred spiral galaxy. The galaxy's spiral arms are quite warped due to the gravitational interaction with its close neighbor on the left of this image, NGC 3729. NGC 3718 features a prominent, dark spiral dust lane wrapping around its nucleus. The core of the galaxy probably contains a supermassive black hole. The smaller companion galaxy, NGC 3729, is a barred spiral as well. It lies quite close (in astronomical terms) to NGC 3718 at about 150,000 light years. For comparison, our Milky Way Galaxy's close neighbor - M31, the Andromeda Galaxy - is about 2 1/2 million light years from us. The group of 5 galaxies below NGC 3729 is Hickson 56 (aka Arp 322). 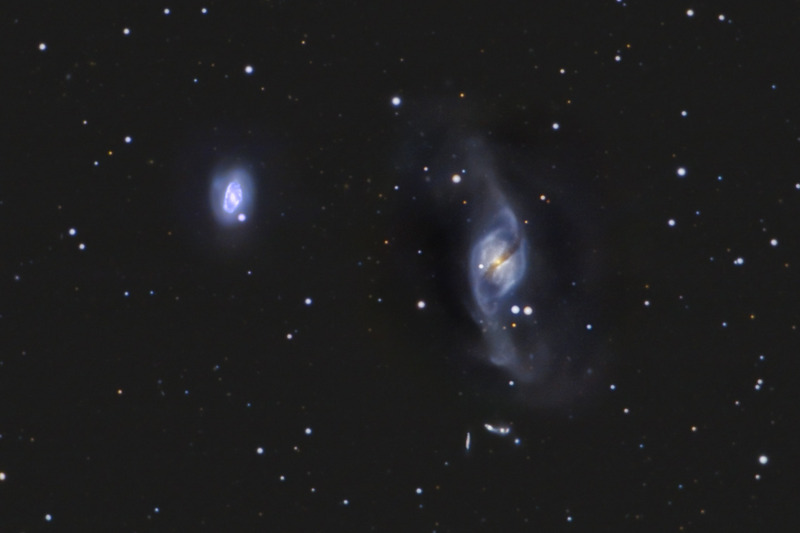 The Hickson 56 group is a background group of galaxies that is 400 million light years from us - 8 times farther than the foreground group of NGC 3718 and 3729. 4 of the 5 galaxies appear to be interacting and linked together. The 5th galaxy (Hickson 56A) is an edge on spiral galaxy. In this image, North is Up. This image is cropped to 58% of the original full frame. Software Used Images Plus 4.0 for camera control, calibration, and stacking. Images Plus 5.0 for digital development, multiresolution sharpening, star shrinking, smoothing and noise reduction. Photoshop CS5 used for levels and curves, selective color, high pass filter, star shrinking, lab color, saturation adjustments, screen mask invert, lens correction, and smart sharpen. Gradient Xterminator for gradient removal. Carboni Tools for additional saturation adjustments, noise reduction, and smoothing. Notes This is a beautiful collection of galaxies. Unfortunately, the seeing on two of the nights I was photographing this object wasn't very good. As such, I don't have the fine detail I would like. I plan on photographing this object again when the conditions are better, and I'll probably try it at f/10 (prime focus) for a better image scale.